President Trump told French President Emmanuel Macron last month that he's ready to put pressure on Israeli Prime Minister Benjamin Netanyahu to accept his upcoming Middle East peace plan, four Western diplomats briefed on the meeting tell me. Trump specifically mentioned the fact the U.S. gives Israel billions of dollars in aid every year. 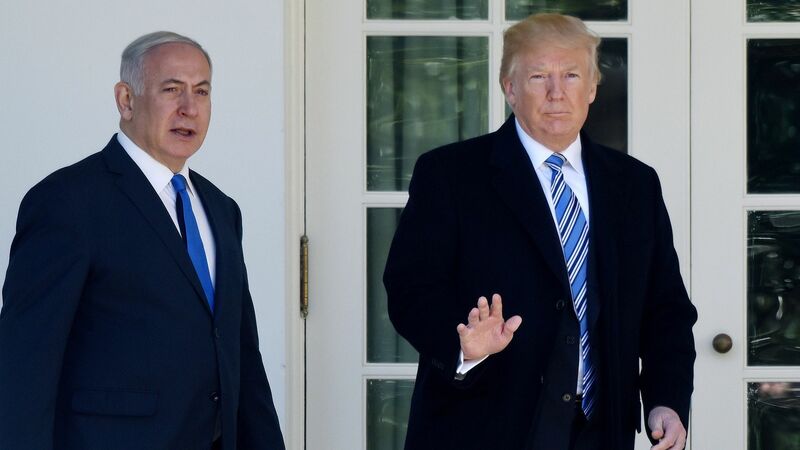 Why it matters: We haven’t previously heard Trump say anything about his willingness to put pressure on Netanyahu, perhaps his staunchest ally around the world. Three days after the meeting with Macron, which happened on the sidelines of the UN General Assembly, Trump met with Netanyahu in New York and announced for the first time his support for the two state solution. In the same meeting, Trump said he was planning to present his peace plan in two to four months. According to the four Western diplomats, Macron told Trump he has the impression Netanyahu doesn’t really want to move on the peace process "because he loves the status quo." Trump said he was very close to reaching the same conclusion. Then Macron asked Trump why he only puts pressure on Palestinian President Mahmoud Abbas. According to the Western officials, Trump said he has been tough with the Palestinians because they don’t want to talk to the U.S. "peace team," and this is unacceptable. Then Trump explained he will be willing to pressure Netanyahu, if needed, when the moment comes. Trump added that he has given Netanyahu a lot — like moving moving the U.S. embassy to Jerusalem. Trump even mentioned that every year the U.S. gives Israel $5 billion in military aid (the correct figure is $3.8 billion). "I can be as tough with Bibi as I have been with the Palestinians." — Trump to Macron, according to four Western diplomats. The White House did not deny this account. A White House official told me: "The President believes that Prime Minister Netanyahu is committed to pursuing a comprehensive and lasting peace between Israel and the Palestinians." This year's UN General Assembly session promises to bring the Israeli-Palestinian conflict back to center stage. The Trump administration's recent decisions on Jerusalem and withdrawal of funding for the UN agency that supports Palestinian refugees, together with a possible announcement at the UN of its "deal of the century," indicate that it is attempting to remove key issues for the Palestinians from the negotiating table. The big picture: The U.S.’ apparent strategy is to decide a priori the fate of Jerusalem and refugees in Israel's favor, and to force the Palestinians to accept an inferior deal. Whether the U.S. unveils the details of its plan during the UNGA session or not, it’s likely to exacerbate tensions in the region. The U.S. seems to want to bypass the Palestinian National Authority by forging close ties with other Arab countries such as Saudi Arabia, Egypt and Jordan, in the hopes that they can be relied upon to bring the Palestinians around. This strategy assumes that Arab states would be able to do so, and that they’d be willing to accept a territorial deal that excludes East Jerusalem. But the fact remains that the parameters of this deal are perceived to be so inferior, indeed insulting, that no Palestinian or Arab leader would accept it. Visits by presidential advisers Jason Greenblatt and Jared Kushner in recent months have underscored this fact. Palestinian leader Mahmoud Abbas recently revealed, for example, that both he and the Jordanian leadership rejected a U.S. proposal for a confederation of Palestinian areas. The international community seems to be ignoring that the majority of the new Palestinian generation have lost hope in the two-state solution and shifted their focus to demanding civic and political rights and raising the costs of the occupation. The most likely outcome is a continuation of the status quo, while the ongoing construction of Israeli settlements in the West Bank and East Jerusalem — now home to more than 650,000 settlers — forecloses prospects for a two-state solution. The bottom line: The international community will have to come to grips with the death of the two-state solution. It is no longer taboo to talk about alternatives, including variations of the one-state solution. That presents a whole new set of problems as the Jewish and Palestinian populations in areas under Israel’s control approach parity. Marwan Muasher is vice president for studies at the Carnegie Endowment for International Peace and a former foreign minister of Jordan.